This story will amaze you with examples of desire, determination, and discipline. The life lessons we learn from training and racing are incredible in and of themselves, but when you overlay that with a car accident and subsequent major trauma, the lessons we learn are worth sharing, and that’s why we are introducing you to Elyse Sitomer, our Featured Athlete. Her coach, Laura Marcoux, shared that Elyse completed IMFL after coming back from a double neck fusion 15 months ago. Elyse was an accomplished athlete pre-surgery but had to completely start over after surgery, beginning with just walking in her neck brace. She couldn’t swim for a while because she couldn’t turn her head to breath, couldn’t run because of the impact, and couldn’t bike because it required picking her head up too high. She completely trusted her recovery specialist, Dr. Mike Reed, who also is a triathlete. Together he, Laura and Elyse put together a progression from surgery to Ironman Florida where she finished in the top 10 in her age group. 1. If it’s not too personal, please share how you injured your neck and required surgery. I was hit by a car while riding my bicycle in 2014. She hit and left the scene of the accident. This was three weeks prior to IM Fortaleza, Brazil. I still raced it. It was determined in 2017 that I had compression of the spinal cord. It was a matter of time before I was going to be paralyzed. I had surgery May 18, 2017. 2. What were your athletic pursuits prior to the injury/surgery? I had raced 5 IM and over 16 half IM. I stopped counting the sprints and Olympics. I would place first or at least top 3 in our local races. I had an 11:50 in IM Western Australia. It was my goal to do a sub 11 race. 3. As you contemplated/prepared for the surgery, what were you considering about your athletic goals and triathlon? Failure is not an option. I worked tirelessly with Mike Reed. He had the confidence and the comeback plan in place. All I had to do was to listen to him. I ran 15 miles the day before surgery. That’s how fit I was. Then I had to start all over. I didn’t know if I would have the will to do it. I didn’t know I would heal so well. Not everyone is as lucky or fit as I am. I think being fit both physically and mentally is what helped me through the whole process. Not to mention coach Laura who was supportive and believed in me when I most definitely didn’t. At first, it was climbing the Inca Trail as a carrot. I had scheduled it one year after surgery. Then IMFL became the next carrot. If I had something to focus on, it helped channel my worry and energy. I really didn’t have a chance to prepare much for surgery. I was going to be paralyzed. I focused all of my energy on my recovery and going back to racing. Mike believed and knew I could do it. I put my faith in him. 4. You set your sites on racing an Ironman after surgery, why IM and why Florida? Good question. I want to inspire other people. It has been a rough 4 years with lawsuits, epidurals, pain, surgery, etc. I didn’t want the injury or surgery to define me. I wanted to change the outcome of the story. That nothing gets me down. I looked at it as a minor setback. Or rather one-year setback. Ironman was the next chapter of my story. I chose IMFL because it was close to home, I didn’t need to take apart my bike and I didn’t need to take off too much from work. We also chose IMFL because it would give me the time to train and because I like flat courses. I’m great with the wind. Too bad the course changed last minute. Therefore, I had to change my expectations. 5. Laura explained the progression you had for your training. In your words, share how that went. I appreciate that Mike was so supportive that he took the time to work with Laura. I felt like it was a team effort. Everyone communicating what needs to be done so I didn’t get hurt along the way. Laura was extremely patient, understanding and supportive. It was up to me to communicate any concerns or pain so we didn’t get off track. As time went on, she knew when to push and how much. I also had to learn how to trust a new coach. I wasn’t only dealing with the surgery. I was working with a new coach. I had one I worked with for four years. I had some habits that needed to be let go. I think Laura is an excellent human being, phenomenal athlete and a great partner as a coach. She definitely worked with Mike to help me come back with a vengeance. 6. How did you practice patience and perseverance during that time? Did you say patience? Bah Ha Ha! (rolling on the floor cackling!) I’m not sure I have any patience. Perseverance has been gained through my 11 years of racing and learning to never give up. I’ve always been wired with the “tenacity” gene. Ironman and endurance training teaches you to keep going with one foot in front of the other. I want to give a TEDTalk. Completing this IM meant I could get through one of the most emotional, physical and financial draining times in my life! I believe in mantras. I have one I use. I AM STRONG. I AM POWERFUL. I AM EFFICIENT. The power of the mind is where I get my strength and tenacity. 7. How did having a coach (Laura) help you navigate your goal? Laura has the knowledge on how to build speed, strength, and endurance. She also has the heart of gold. She made me feel like a human being and not just another number. What separates her from my last coach is her ability to connect with me. She is also an athlete. She made me feel like she cared. I trust Mike Reed implicitly. When he recommended D3, I didn’t blink. When Laura was responsive and worked diligently with Mike, I didn’t blink. She called me before races to wish me luck. She was there for me. Anyone can follow a racing plan. A coach is your trusted adviser. With Laura she was not only my coach, she became my friend. She helped me do something I lost all faith and hope in. Her love, support, and knowledge helped me over the edge! 8. 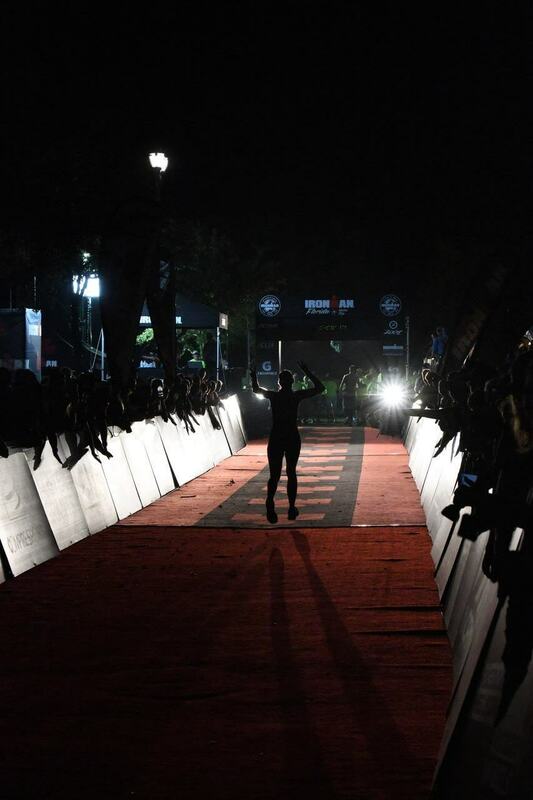 Please share what you were thinking about either the night before or the morning of IMFL … what was going through your mind during that final stretch until the start. I felt grateful. Grateful for having the athleticism to compete. I knew I would finish. If I had to crawl, whatever it took. Grateful for a coach and a support system (including friends, training partners). Grateful that they didn’t cancel the race entirely. Grateful for the triathlon community. Its a special community and a privilege. I was nervous the night before, trying to remember my race plan. I am very purposeful in a race. I stick to what I trained for. Laura gave me a wonderful run plan with words of wisdom. I read that a few times to inspire me. She taught me how to cope for when things don’t go your way. That was the best piece of coaching I have ever received. 9. The race was successful! Describe your thoughts and emotions about the race and your experience through it. Yes, it was successful because I finished and placed top ten. Something I have been trying to do for a while. The race didn’t go as planned. My body didn’t respond how I thought it would. So this race was about adjusting expectations and keeping a calm mind throughout the course. I had so many friends on the course either participating or spectating. There were tons of surprises along the way. I just tried to have fun the entire time. I had friends who raced in our local city of Jupiter and then drove 2 and 1/2 hours just to cheer us on! Mike Reed and his son volunteered at an aid station. I got to see him three times and I hugged him on the last one. I had an angel, help me run through the last two miles. She shared a personal story. The best surprise was Laura’s brother, Carl, on the course. He came up to me and said, “there are eyes watching you along the way.” He told me that he was Laura’s brother and she was so proud of me. He encouraged me along the way. I saw him three times. On the last loop of the run, he had Laura on the phone and I got to race with her encouraging me. Priceless! 10. What else would you like us to know about you? I am more than an athlete. In fact, that makes me giggle. If you only knew me about 31 years ago, I was overweight and was not athletic. To be able to compete and be pretty good at it is astounding to me and anyone else who knew me when. I am someone who loves life, loves to experience new things and loves to be challenged. Being part of the tri-community has helped me become such a strong, powerful and confident human being. As Kate T. Parker writes in the title of her book, “Strong is the new pretty.” I think that’s my new mantra. We are all so proud of Elyse and are pleased to turn the spotlight on her!